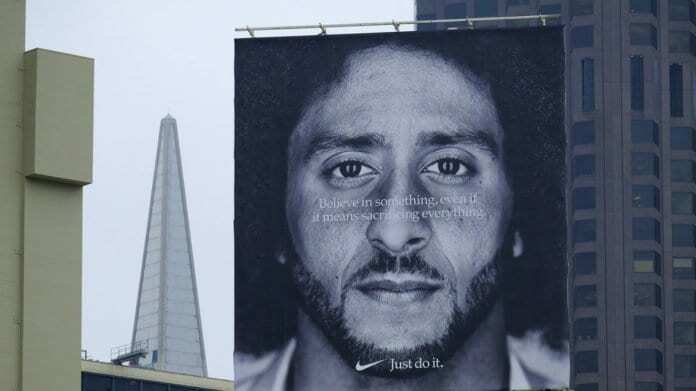 Mack Morris, the senior pastor of a Woodridge Baptist Church in Mobile, Alabama, destroyed his own Nike gear during a sermon in which he criticized the sports brand’s advertising deal with former San Francisco 49ers quarterback Colin Kaepernick. Morris then used scissors to chop up his sweatband and headband and tossing them to the side. The pastor continued his tantrum as cheers came from from the congregation. “I ain’t using that no more,” Morris added. “Colin Kaepernick. He’s just inked a contract with Nike. “Nobody knows and nobody’s telling how many multi-millions of dollars that is going to be simply because he does not want to stand when the national anthem is being sung,” Morris added. Morris seems to not know or care that Kaepernick began the protests in 2016 to protest police brutality and racial injustice and not as a protest of the anthem, flag or military. Nike’s decision to tap Kaepernick, who has been kept out of the NFL since the end of the 2016 season, to be a spokesman for the company’s 30th Anniversary of its “Just Do It” campaign set off anger among conservatives last week. It led to numerous videos on social media of similar temper tantrums by people angry that the company re-signed the exiled quarterback. Ben Zahn, the mayor of Kenner, Louisiana, attempted to ban the city from purchasing Nike products for the city’s recreations department last week. Amid angry protests, he rescinded the ban on Wednesday. It should be noted there is one thing that Morris did not destroy. He did not cut up his beloved Nike sneakers and he didn’t make clear whether he still plans to wear while running.